Think it's safe to drive the rental car through here? When road conditions are bad, just go around. 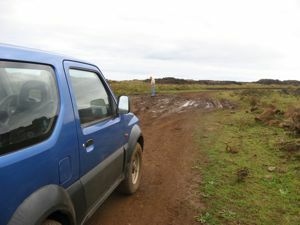 In Easter Island, we did document rental car damage. When you pick up your rental car, you should do a thorough walk around to check for dents, scratches or any other damage. You should also check to see if there is a spare tire and any required safety equipment.... many countries require safety vests, safety flares or reflectors and/or first aid kits. 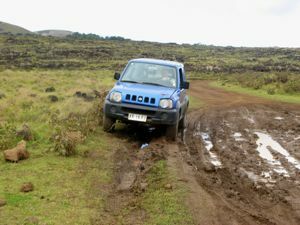 If you're going to be driving on unpaved road, it's generally better to buy the extra insurance most rental car companies offer. All of that it good advice, of course. We always get it documented when we find damage on rental cars. We point our even slight scratches and dings. And at the end of a trip, if we haven't checked the car back in with an agent, we take pictures to show that we returned it with no damage. Some independent agencies abroad are very fussy about any damage.... others are very loose and casual, but we never want to get caught being lazy about examining the car, and then get caught paying for damage we didn't cause. Sometimes you run into funny situations where it just doesn't matter! 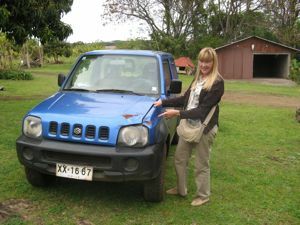 On this trip to Easter Island, as you can see, our rental car was one big ding! On Rapa Nui, as the locals call it, everything is pretty laid back. So, since we were getting into the spirit of Isla de Pasqua (the Spanish name for Easter Island), we took her up on her offer. We're pretty sure this car belonged to a cousin or a brother or some other relative.... We never signed a contract and there was no talk of extra insurance.... let alone the pressure you sometimes get at the car rental counter! I mean, we never even knew who owned the car... it just showed up, and our hostess gave us the keys for two days. They never knew our names, and we paid cash. 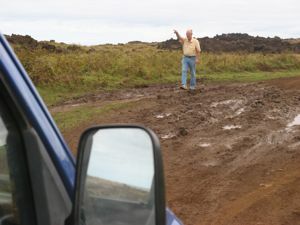 The dirt roads around Rapa Nui made the driving slow and sometimes treacherous, but it was a great way to see those giant statues.... the Moai scattered around the island. And we had no worries about denting the car! Always go with your gut reaction when you get into situations like this. There are places in the world where you just shouldn't do this. We had read that Easter Island had a lot of guest houses, and that they could help make arrangements. We trusted our hostess and had a great experience... and funny stories to tell. Oh yea... we did document rental car damage at the start of this travel adventure... just so we could show you! Read more on our serious advice about foreign rental cars. And if you would like some travel tips on the mainland, Chile Attractions can help.